My favorite thing to do in Seattle is completely free. 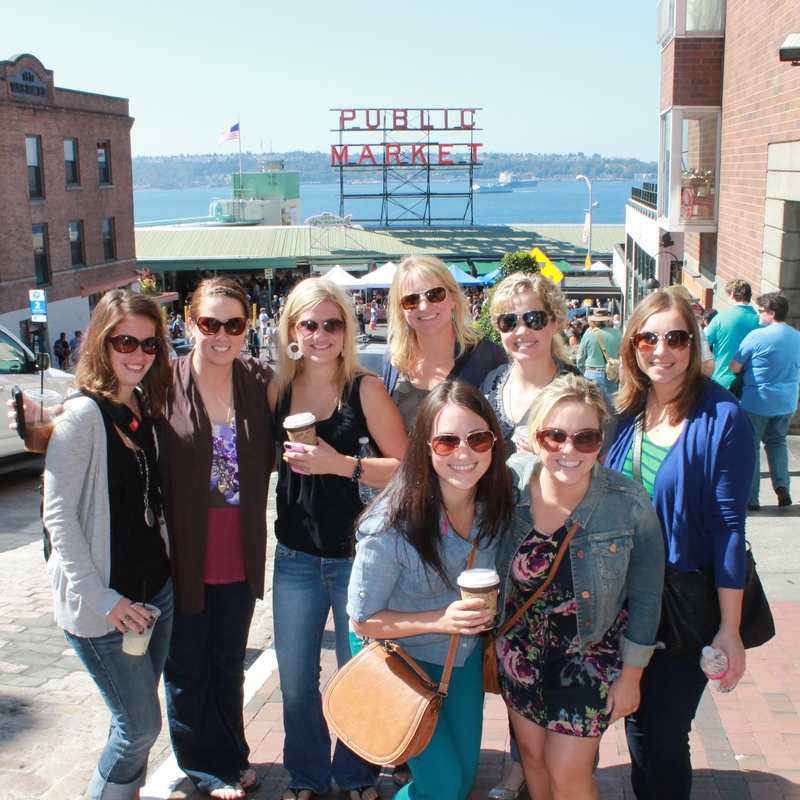 Pike’s Place Market can be found on any “Top 10 Things to do in Seattle” list so this is no insider secret. But after more than a half-dozen trips to Seattle it still tops my own personal list. 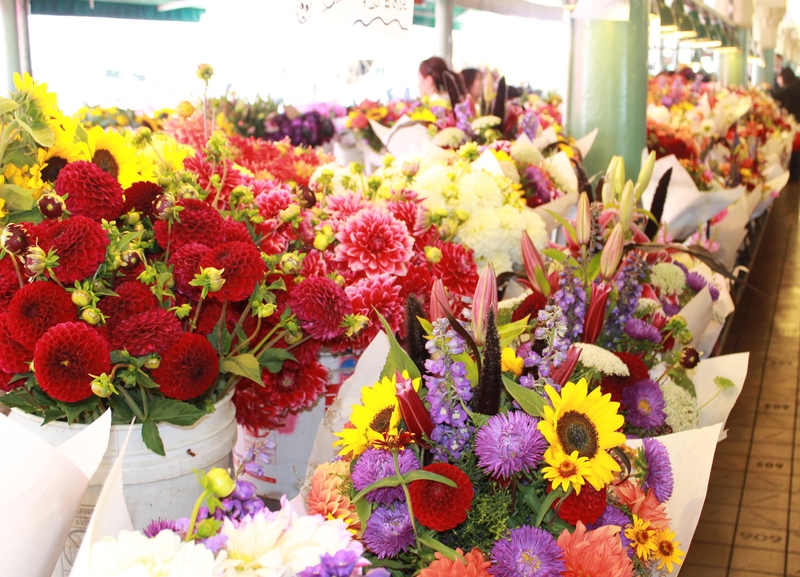 I could spend the entire day wandering around the market admiring the colorful displays of fresh fruits and vegetables, rows and rows of beautiful flowers and unique hand crafted items. Of course, I never actually spend the entire day there (too many other things to see) but the market really lends itself to a few hours of mindless wandering. 1. Flowers – You can find a gorgeous bouquet of flowers wrapped in white butcher paper for $10-$15. A comparable bouquet at a flower shop would cost twice or even three times that amount. A tour guide once told us that men taking the ferries to and from work would stop by the market and pick up flowers on their way home (men take note). 2. 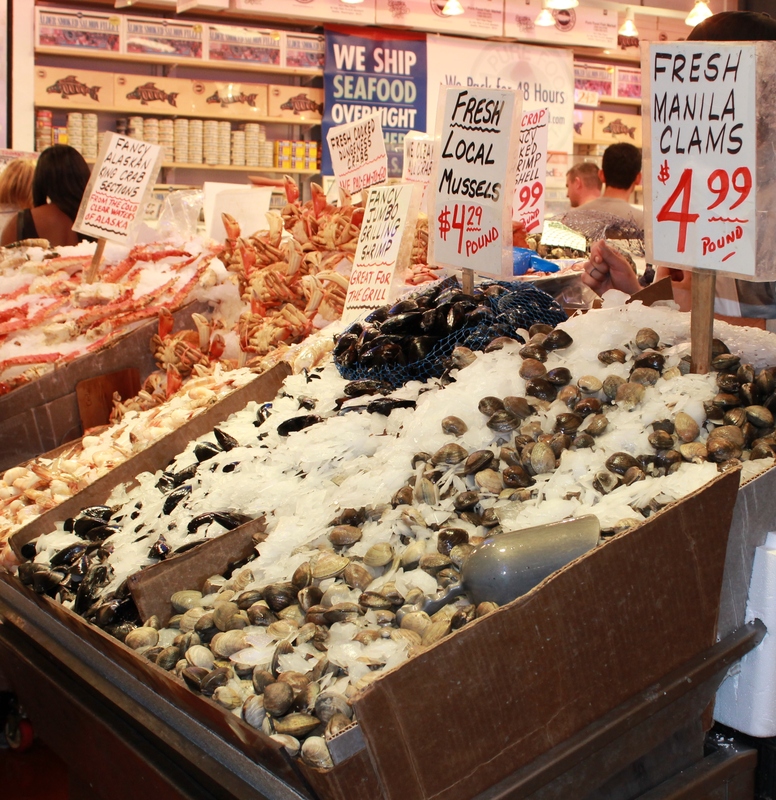 Seafood – Whether you’re looking for a shrimp, clams, crabs legs or a big King Salmon, you’ll find the freshest seafood at Pike’s. And the best part? They’ll ship your order (expedited) so you can still enjoy fresh seafood when you get home. Hungry now? Pick up a slab of smoked salmon on a stick for around $8-$10. 3. 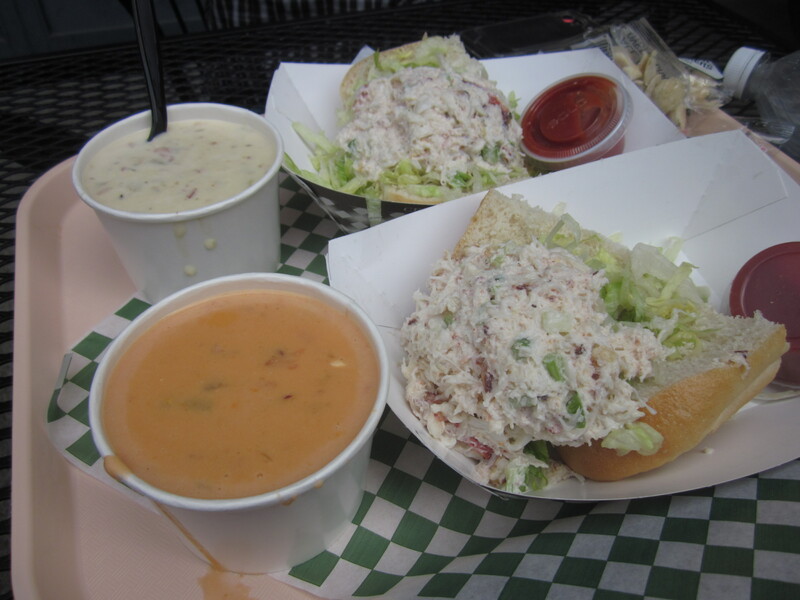 Chowder – There are a number of places to get excellent chowder in Seattle but one of my favorites is a little shop tucked away in Post Alley called Pike’s Place Chowder. Try the chowder sampler or their signature special – a bowl of chowder and a half crab roll with tangy cocktail sauce. YUM. 4. Fruits and Vegetables – It’s not unusual to walk through the market and receive a sample of fresh produce from one of the vendors. 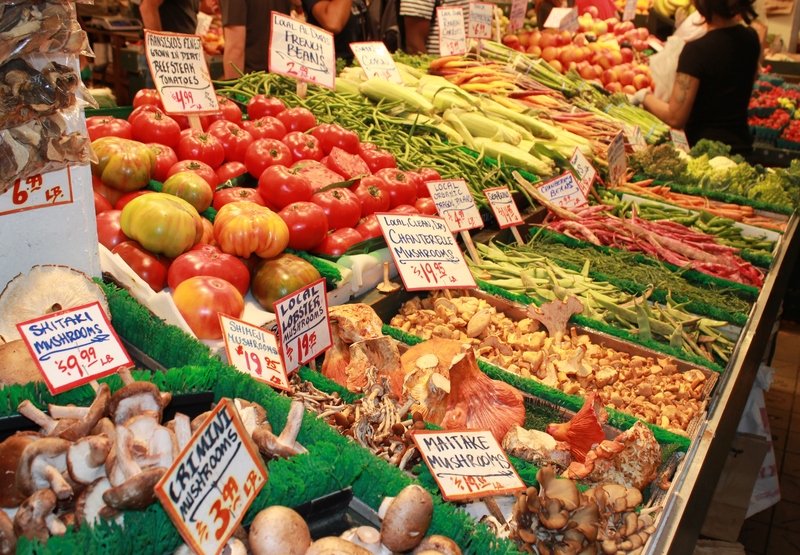 You’ll find everything from fresh picked berries to northwest mushrooms and heirloom tomatoes at the market. The food displays are so beautifully organized and colorful that you almost don’t want to touch them – until you taste the food and want more! 5. Pike’s Place Sign – If you visit the market, you must get a signature photo in front of the Pike’s Place Market Sign. According to our tour guide, it’s one of the most photographed places in the city. And if you really want to fit in with the crowd, be sure you have a coffee in hand. #6. Hand-crafted items – Over 200 artists contribute their one of a kind works of art to the market. A few of our favorite finds include beautiful silver jewelry, cultured pearl rings, leather cuffs, paintings, mounted photographs, and various woodwork. Whether it’s a piece of jewelry for yourself or a painting to hang in your home, I highly recommend picking up a unique piece of artwork from the market. Out of respect for the artists I refrained from taking pictures of their work. What recommendations do you have for other free things to do in Seattle? Any other “musts” at the market?